Volkswagen is known for its classical cars, the Volkswagen Beetle is another classical car which has been on roads for more than seven decades. It is a well-established icon in the car industry. Through proper search, it is possible to get a used VW Beetle that too in good condition of your electric car conversion project. My personal preference has always been 20 years old VW Beetle as compared to a newer car. This brand become so popular that the company re-established the brand and Beetle is still available in the market. The idea of manufacturing Beetle was initially given by Adolf Hitler, who wanted a car for masses which in actual terms can be considered people car. It was also a step to eradicate unemployment after World War 1. Hitler had two point agenda, one to give people a car which they can afford, and to generate employment for the people. It was in 1930 that Hitler started a project to build a car for every citizen of Germany, so the birth of Volkswagen took place. In Germany Volkswagen word means “people’s car”. The original model of beetle was designed by Ferdinand Porsche, who became famous later for Porsche range of cars which are still being manufactured and marketed. Porsche designed a car which had engine in the rear side, it had air cooled four cylinder engine, these specifications were given by Hitler, who thought these cars, would be quite inexpensive. He wanted that everyone should be able to afford this car and it should able to seat two adults and three children. Over the rest of the century, Volkswagen became the most popular classical car and still is, it has created waves across the world due to its technology and pleasant drive. Thousands of cars were manufactured and marketed, because it offered the most inexpensive and simple motoring which lasted for ever. Most of the German advertising promotional films shot were full of amazing Beetle, driving at top of a steep or in sand dunes, rolling and then running again. This was to show the toughness of Beetle; even now people can find and buy Beetle which is strong as ever. There are many owners who have upgraded their VW to classical condition, this give them edge over other car owners as they are proud owners of Beetle. You can find car clubs which are based exclusively around VW Beetles, there are many frames and chassis built to other hand built on vehicles. Some of the examples are many dune buggies built entirely on VW Beetles. If you are fond of cars Beetle can provide you with excellent choice. Market for Beetles is very strong but good news is that there are plenty of supplies also, that makes your choice more clear and you will not get disappointed. 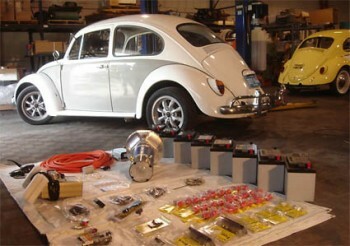 Sourcing the Beetle as your EV conversion donor car would be a pleasant experience. Once you decide to be proud owner of Beetle, you can always boast to be proud owner of Beetle even though it is powered by an electric motor. Beetle today is the most popular brand of Volkswagen across the world. People who own it are really happy to enjoy the smooth driving of this car. Do you want to know how to convert a conventional gas guzzler to a clean electric vehicle? 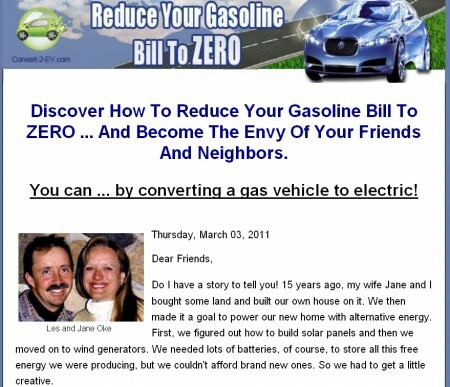 If you do, check out the Convert2EV manual by Les and Jane Oke. The Okes are true green enthusiasts and they drive a homemade electric car to keep their carbon footprint small. The ebook was written based on their experience retrofitting normal cars to run on electricity. Click on the link below to visit their web site right now.